The United Youth Camp in Ghana was held on the spacious grounds of the Valley View University campus, located on the outskirts of the capital city of Accra. 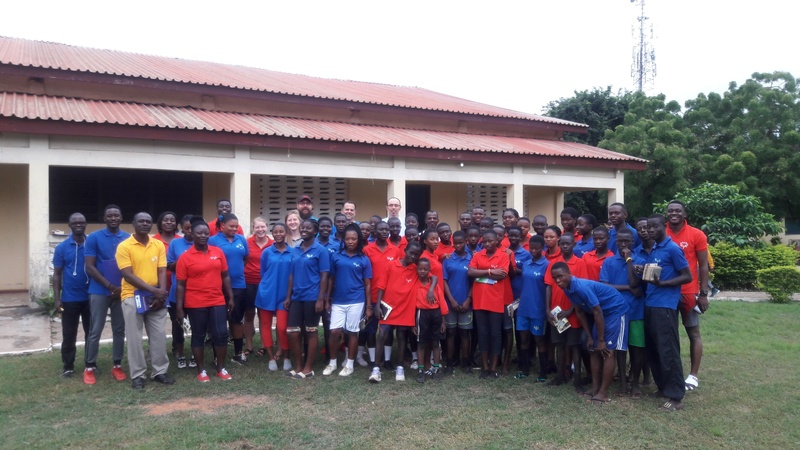 Group shot of all who attended camp in Ghana. Each day started with a 5 a.m. wakeup call for aerobics, followed by breakfast and the spiritual compass check message. Daytime activities included team challenge, volleyball, basketball, speedaway, sling shooting, cycling, archery, bead crafts and a new activity for this year, swimming. The evenings consisted of dinner, followed by a Christian living class reinforcing the sub-theme for each day. Open fellowship time then continued until bed. A major highlight of this year’s camp program was the participation of six United Youth Corps volunteers. Four volunteers traveled from the United States and two from Malawi. They staffed many of the camp activities and spent much time interacting personally with all of the campers. Two of the Youth Corps men also assisted in teaching the compass check and Christian living classes. The general consensus is that this was the best camp program that Ghana has seen in many years. Thanks to the spiritual focus, Youth Corps volunteers and activity enhancements, many good memories were formed and relationships strengthened. The enthusiasm was evident among all present.